The cryptocurrency world became quite popular among people in the last years. However if you are not fully informed at all times it can be quite difficult to keep your investments safe. Getting alarms for price movements of your choice can help you make better decisions for sure. How to do that? With the right app on your phone, you can get alerts whenever there is a change is specific cryptocurrencies you are interested in. We discovered the best app for that purpose. Let’s see what the app offers you. This productivity app is especially developed on android platform as one easy to use and very efficient cryptocurrency alert app that is offering users the simplest features that will help them to keep track of the latest cryptocurrency rates, staying up to date with the cryptocurrency world, getting alerts and charts about the changes in cryptocurrencies they are following. Using this app will help the user stay informed and be alerted, learning everything he needs about the cryptocurrencies that interest him. Why do we choose Crypto Alert? Crypto Alert has to offer its users various features that will allow them to instantly track and get alerts about the cryptocurrencies they want to be informed of constantly. With the help of the app, the user is able to get the latest cryptocurrency rates and stay up to date with the rates of cryptocurrencies they are interested to track. 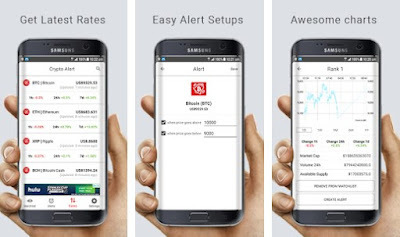 On the app is offered easily alert setups and the user has the chance to easily set alerts for cryptocurrencies just by using the phones. Users with the app are also getting awesome harts with simple graphics that are making the charts easy to digest and with full details that will help users understand the cryptocurrencies easily. Simple alerts are offered on the app so the user has the chance to get them directly on the dashboard of his phone to instantly keep to date with the cryptocurrencies he follows. All offered inside one simple app, users will never miss again another change happening in the cryptocurrencies they follow, instantly receiving alerts from the cryptocurrency world and learning everything about specific cryptocurrencies. Download this app on Google Play for free to get alerts for the cryptocurrencies you are interested in!